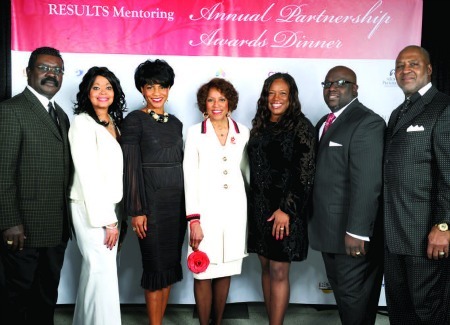 The Results Mentoring non-profit organization recently hosted a dinner to honor five of Detroit’s top community leaders and exemplary mentors. WDIV reporter Chauncy Glover served as the master of ceremonies. Honorees were Marvin Beatty, chief community officer of Greektown Casino and chairman of the Coleman A. Young Foundation; Joyce Hayes Giles, assistant to the chairman and senior vice president of Public Affairs, DTE Energy; Monique Marks, executive director of Franklin-Wright Settlements; Sid Taylor, president and CEO, S.E.T. Enterprises and founder of Real Life 101 Scholarship Fund, and Rhonda Walker, WDIV reporter/anchor and head of the Rhonda Walker Foundation. The event, held at DTE Energy headquarters March 15, featured a surprise performance by Motown recording artist KEM. Results Mentoring offers an extensive mentoring and monitoring program to break young people of bad habits and negative mentalities. The Results Mentoring “Annual Partnership and Awards Dinner” honors community and business leaders for making a difference in the lives of young people.